Apergy – Your Production Partner for the Life of the Well. Selecting the right form of artificial lift can be a complex process at any stage of a well’s producing life. Horizontal wells will typically use between two and four types of lift over the life of the well. Apergy offers all types, and has the application expertise to know how and when to apply them. We review the many parameters that go into selecting the optimal lift system for a well at a given time, including bottomhole pressure, type of produced fluid, volumes of fluid to be produced, wellbore geometry and depth, GLR and the well’s location. And of course, we also consider the operator’s own experience and preferences when selecting the form of lift. During the well’s early life, production rates are high and the fluid stream likely contains high volumes of sand and formation solids. We provide hydraulic jet pumps that successfully operate under these conditions, and allow the operator to clean up the well while producing at the highest sustained rates for the longest period of time. As the well’s production rate starts to decline, we provide ESPs in multiple configurations that efficiently handle changing flow rates. And by incorporating our expanded range pump stages and variable speed drives, we can extend the operating range of our ESPs. As well conditions continue to change due to reduced reservoir pressure, increased water cuts, and decreasing gas-to-liquid ratios, we provide gas lift solutions that achieve consistent production. 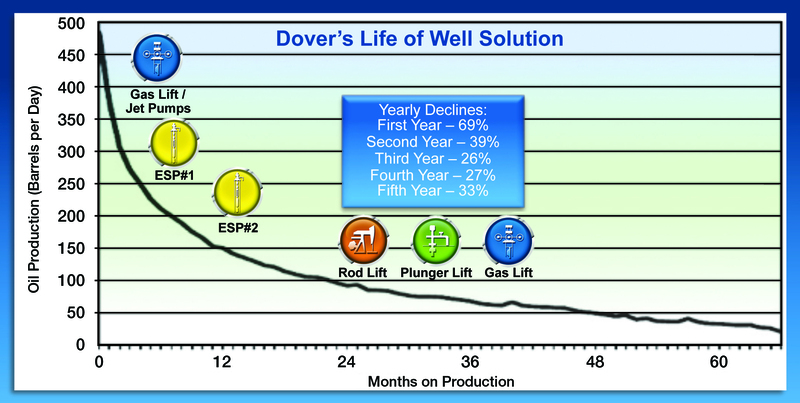 As the well continues to decline, at some point the well might only be producing at 25% of its initial rate. Apergy experts help the operator transition to a cost-effective rod pumping solution, which includes products such as coiled rod to provide efficient lift in horizontal wells. As the well declines further, we can provide a low-cost plunger lift system to maximize production and extend the well’s operating life. The scenario above is merely a representative example of our technologies and services, and by no means the only path to sustained production. Using the well’s parameters and your production goals as starting points, we work with you to develop the optimal artificial lift strategy at each stage. And, we provide long-term service support to ensure that each lift solution runs precisely as it should to extend production rates while reducing your capital and lease operating expenses.